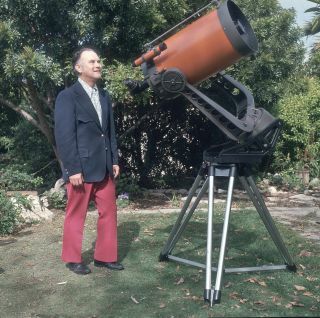 Celestron founder Tom Johnson poses with a Celestron telescope. The technology of amateur telescopes has made huge strides over the last 60 years. Fifty or 60 years ago, there wasn't much of a market for mass-produced amateur telescopes. Many amateurs built telescopes themselves, which made the instruments expensive and harder to get. Today, it's possible to buy many different types of telescopes in stores, with features ranging from computerized systems to specialized cameras. This began to change in the 1960s, when Tom Johnson, founder of Celestron, teamed up with business professional Alan Hale to create the first mass-produced Schmidt-Cassegrains. Because the Schmidt corrector had a more complex shape than did the optical components of a traditional reflector or refractor, these telescopes were considered more difficult to make. It was rare for an amateur to have this kind of telescope before this time. "The big advantage was portability," said Bryan Cogdell, Celestron's product manager for astronomy, pointing out that the Schmidt-Cassegrain has a long focal length despite its short physical size. Focal length refers to the distance from the objective to the eyepiece or detector in a telescope; in the Schmidt-Cassegrain's case, the mirrors inside the telescope allow the focal length to reflect the beam of light multiple times. Schmidt-Cassegrains have been praised because they have many of the capabilities of both refractors — telescopes that use lenses to bend light (for example, providing an upright image when used with a star diagonal) — and reflectors, which have a big light-gathering potential and mainly use mirrors. This makes Schmidt-Cassegrains good all-around telescopes, almost equally capable of showing planets and stars. "You could buy it off the shelf. It was portable. It could do a little bit of everything," Cogdell said. While Schmidt-Cassegrains have maintained basically the same design, they have grown lighter over the decades and now also include a wealth of technology not available even a few years ago. One of the first major advances came in the 1970s, when tracking systems became available for commercial telescopes, said Cogdell. "It was not a computer, but just a tracking platform for the mount," he said. "It was available to amateurs to track objects in the night sky." About 10 years later, however, telescopes were capable of telling the user where to position the telescope using digital encoders that displayed the telescope's coordinates. Today, skywatchers are more used to using digital "go-to" systems, such as the Compustar, the first commercially available telescope of this sort. "All you would do is key in the object coordinates or names, and that has been the big push ever since," Cogdell said of such go-to systems. In the last couple of years, Celestron has been pushing forward on alignment systems that require no user help at all. Using StarSense technology, a small telescopic camera takes pictures of three different sections of the sky to automatically align the telescope. With great digital cameras now available even in phones, there has been a surge of astrophotography in the past decade. The newer Schmidt-Cassegrains are designed to have optics that are more camera-friendly, but there are other advances to make astrophotography even more pleasant. Celestron makes specialized cameras for its telescopes, but it understands as well that people couple Nikons, Sonys and other types of consumer cameras to the telescope. One advance is improving the tracking accuracy of the telescope so that there is less blurring of the stars (and other objects) during long exposures. "We have improved software-integration to make the existing hardware work better than it does now," added Cogdell. He pointed out that a typical astrophotographer might have software to control the telescope and a separate type of software to control the camera, and might need to work on a desktop and iPad simultaneously to see and edit images. Future software packages may offer more of a one-stop solution, Cogdell said.